Recombinant fragment within Human RANK. The exact sequence is proprietary. Recombinant fragment containing the extracellular domain (amino acids 33-208) of human RANK. WB: RAW (a mouse macrophage monocyte). IHC-P: Human T cell lymphoma and skin tissues. Our Abpromise guarantee covers the use of ab13918 in the following tested applications. IP Use a concentration of 1 - 2 µg/ml. WB Use a concentration of 1 - 2 µg/ml. Detects a band of approximately 97 kDa. Flow Cyt Use 5µg for 106 cells. Receptor for TNFSF11/RANKL/TRANCE/OPGL; essential for RANKL-mediated osteoclastogenesis. Involved in the regulation of interactions between T-cells and dendritic cells. Ubiquitous expression with high levels in skeletal muscle, thymus, liver, colon, small intestine and adrenal gland. Defects in TNFRSF11A are the cause of familial expansile osteolysis (FEO) [MIM:174810]. FEO is a rare autosomal dominant bone disorder characterized by focal areas of increased bone remodeling. The osteolytic lesions develop usually in the long bones during early adulthood. FEO is often associated with early onset deafness and loss of dentition. Defects in TNFRSF11A are a cause of Paget disease of bone type 2 (PDB2) [MIM:602080]; also known as familial Paget disease of bone. PDB2 is a bone-remodeling disorder with clinical similarities to FEO. Unlike FEO, however, affected individuals have involvement of the axial skeleton with lesions in the spine, pelvis and skull. Defects in TNFRSF11A are the cause of osteopetrosis autosomal recessive type 7 (OPTB7) [MIM:612301]; also called osteoclast-poor osteopetrosis with hypogammaglobulinemia. Osteopetrosis is a rare genetic disease characterized by abnormally dense bone, due to defective resorption of immature bone. The disorder occurs in two forms: a severe autosomal recessive form occurring in utero, infancy, or childhood, and a benign autosomal dominant form occurring in adolescence or adulthood. OPTB7 is characterized by paucity of osteoclasts, suggesting a molecular defect in osteoclast development. OPTB7 is associated with hypogammaglobulinemia. Formaldehyde-fixed, paraffin-embedded human skin tissue stained for RANK using ab13918 at 1/50 dilution in immunohistochemical analysis. Detection of RANK in RAW cells. Lane 1: mouse cell line. Lane 2 & 3: IP/Western blot analysis of RANK. RANK protein from RAW cell lysate was immunoprecipitated either with control antibody (lane 2) or ab13918 (lane 3), and detected with ab13918. IHC image of ab13918 staining in human t cell lymphoma formalin fixed paraffin embedded tissue section, performed on a Leica BondTM system using the standard protocol F. The section was pre-treated using heat mediated antigen retrieval with sodium citrate buffer (pH6, epitope retrieval solution 1) for 20 mins. The section was then incubated with ab13918, 5µg/ml, for 15 mins at room temperature and detected using an HRP conjugated compact polymer system. DAB was used as the chromogen. The section was then counterstained with haematoxylin and mounted with DPX. Publishing research using ab13918? Please let us know so that we can cite the reference in this datasheet. They are all compatible with IHC. Can you tell me if they will also work for FACS (Runx2; BMP-7 and OPG)? All tested applications and species covered by our 6 month guarantee are specified on our datasheets, and these are updated as soon as any new information is brought to our attention. Therefore, I can confirm that RANK antibody ab13918 is indeed tested and covered by the guarantee for both IHC-P and flow cytometry. This is tested for IHC-P (paraffin embedded sections) as stated on the datasheet. However, I am sorry to confirm this has not been tested in flow cytometry. The following RUNX2 antibody is tested in flow cytometry, I hope this may be of interest to your customer. However, please note this has not been tested in IHC and you will also need to check which species the customer is using. This has been tested and covered by the guarantee for human samples only. https://www.abcam.com/index.html?datasheet=135674 (or use the following: https://www.abcam.com/index.html?datasheet=135674). https://www.abcam.com/index.html?datasheet=12125 (or use the following: https://www.abcam.com/index.html?datasheet=12125). https://www.abcam.com/index.html?datasheet=95720 (or use the following: https://www.abcam.com/index.html?datasheet=95720). https://www.abcam.com/index.html?datasheet=93553 (or use the following: https://www.abcam.com/index.html?datasheet=93553). This is tested for IHC-P (paraffin embedded sections). However, I am sorry to confirm this has not been tested in flow cytometry. https://www.abcam.com/index.html?datasheet=84030 (or use the following: https://www.abcam.com/index.html?datasheet=84030). https://www.abcam.com/index.html?datasheet=105935 (or use the following: https://www.abcam.com/index.html?datasheet=105935). If your customer would like to test any of these antibodies in a previously untested species or application, please do not hesitate to contact us again prior to the purchase by replying to this message as you may be eligible for our testing discount program. I hope this information is helpful. Please do not hesitate to contact me for any further advice or information. What I get that you are suggesting is that I test this ab22106 antibody using a Western blot and it might work but what I need is an antibody that works for IHC. What is the homology % with the ab13918? The identities of ab13918 with canine were 81%, with 89% positives and some gaps. This is generally the absolute limit for what we consider to be effective. I chose to recommend ab22106 because it was created with a shorter immunogen which shared similar identies. However the differences between the canine and immunogen are at the very end residues whereas the the differences with ab13918 are scattered throughout. Thank you for your reply. I am pleased to provide the following information: We have two RANK antibodies tested flow cytometry, human and mouse (not IHC or rat): ab45092 RANK antibody [9A725] (Phycoerythrin) Mouse monoclonal Tested applications: Flow Cyt Reacts with: Human, Mouse Click here (or use the following: https://www.abcam.com/index.html?datasheet=45092). ab13918 RANK antibody [64C1385] Mouse monoclonal Applications: Flow Cyt, IP, WB Reacts with: Human, Mouse Click here (or use the following: https://www.abcam.com/index.html?datasheet=13918). 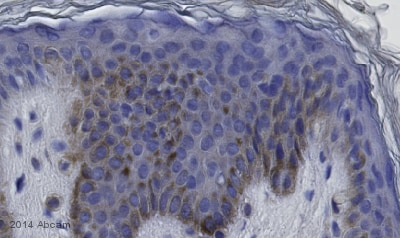 One antibody tested in IHC-P, mouse and human (not rat or flow cytometry): ab45039 Anti-RANKL antibody [12A668] Mouse monoclonal Tested applications: ICC/IF, IHC-P, WB Reacts with: Human, Mouse Click here (or use the following: https://www.abcam.com/index.html?datasheet=45039). I am sorry to confirm we have no RANK antibodies tested in rat. Regrettably I am not able to find the correct rat sequence on the protein database sites, and so am not able to check the alignments with rat. If you have access to the rat sequence, I can suggest to try alignment to the immunogen for these antibodies. We recommend alignment should be over 85% to predict that an antibody will detect in a different species. I am sorry we also do not have an antibody tested and guaranteed in both IHC and flow cytometry. If you would like to test one of the antibodies in one of these untested applications, we would be able to provide a testing discount offer. Please let me know if you are interested, and I will be pleased to forward the details. This also applies to the rat species. If the alignment is over 70% , we would be able to provide a testing discount for you to try in rat. I am sorry we do not have an antibody that is tested to meet all your requirements on this occasion, but I hope these ones will still be of interest to you. If you have any further questions, or are interested in the testing discount, please do not hesitate to contact me. Thank you for your assistance with this matter. Upon reflection of our attempts to use this antibody, we have decided that we would prefer to have a refund for this purchase. Thank you for your email. I have instructed our accounting department to issue a refund for your order for ab13918. If you have any questions regarding the refund, please contact accounts@abcam.com If I can be of additional assistance, just let me know. Have a nice weekend! Thank you for your email and patience. I enquired with the originator of this antibody and evidently RANK is a tricky protein to detect and depending upon how the RAW cells were cultured, you may or may not see a signal. However, I would expect that with a dilution as high as 1:100 and incubation overnight at 4C (which you said that you tried) that you would see something. There have not been any problems with this lot reported, but I can offer to send a free of charge replacement vial from a newer batch. Alternatively, I can offer a refund or credit note. Please let me know how you would like to proceed. We ordered your RANK antibody ab13918 back in July, and after alloquoting and freezing it, hadn't gotten around to using it until this past month. I've been trying to do Western analysis of RANK expression from RAW cell lysates, and have not gotten any expression with this antibody. I have tried concentrations from 1:100 to 1:1000 (1:500 = 2 ug / ml), have tried incubation times ranging from 1hr at room temp to overnight at 4 degrees (also tried 1 hr room temp, overnight 4 deg, followed by an additional hour at room temp). I have also tried both HRP- and Cy5- conjugated secondaries, at various concentrations. I am now extremely frustrated with this antibody and am considering purchasing another RANK antibody from another source. Can you offer any suggestions as to how to remedy this problem? Thank you for your enquiry and I'm sorry to hear that you are experiencing difficulty with ab13918 in Western blotting. I do need a few more details in order to trouble-shoot this: How much protein did you load? Did you use reducing conditions? How were your samples prepared? What did you block with? Is the secondary antibody working with other primaries? Did you check that the protein transferred properly to the membrane? Also, what was the purchase order number or Abcam reference number that was used when you ordered this antibody? Thank you, and I look forward to hearing from you.